So Animazement is this weekend, which is where Dustin is going to make his trek once again and needs to put something out this month. So, it’s time for our hosts to combine their Hamon powers into one, by letting this podcast take it’s rightful STAND in reviewing Jojo’s Bizarre Adventure: Battle Tendency. 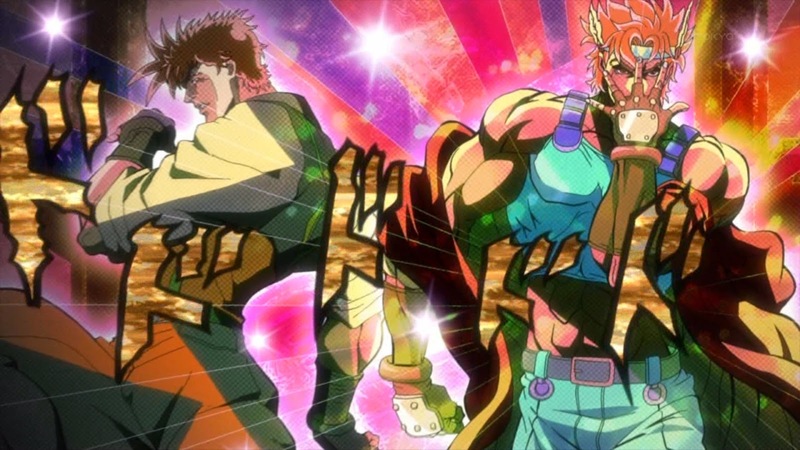 (0:00 – 1:18:20) Review: Jojo’s Bizarre Adventure: Battle Tendency – Since its been a few years since we reviewed Phantom Blood, this podcast is able to combine four entities into reviewing Jojo’s once more. But, in a twist of foreseen fate, our guest Daft was a Troll Pillar Man the whole time!! How will Dustin, Jonn and Josh combat this despicable fiend? By basically letting him do whatever he wants to the show. In all seriousness, Jojo’s ended on Toonami, so the four hosts came together to talk about it. Actually, it was mostly a critique off a Toonzone thread of some mod bashing the show, so there was a lot to say on that. There is also discussions on Chris Chan mummified shirt being discovered, Nazisploitation films, Josh and his experiences with anime clubs, how Mega 64 paid homage to our podcast, 4D theme park rides, and how Disneyland employees handle guests suicide. (1:18:20 – 1:48:00) Closing Remarks – This gets the hosts talking about if our world will be going to World War 3 again, Jonn buying the new Zelda game, SNES Mini discussion, the History of Buy-Rite Video Games, anime releases coming out soon like Record of Lodoss War and titles from Discotek, and much more. This entry was posted on 05/23/2017 by zeonicfreak. It was filed under Anime, Guests, News, Other, Reviews, Video Games and was tagged with Buy-Rite Video Games, Chris Chan, Discotek Media, Disney, Ilsa She Wolf of the SS, JoJo Bizarre Adventure, Record of Lodoss War.